Step into the Portal of Power. Having achieved success with Skylanders Cloud Patrol and Skylanders: Lost Islands, it was only a matter of time before Activision brought a more console-like experience to iPhone and iPad. The result, Skylanders Battlegrounds, doesn't mirror Skylanders Giants, but it carries a similar appeal, thanks to strategic combat, a wealth of Skylanders characters and, for the first time on iOS, integration with the franchise's Portal of Power. 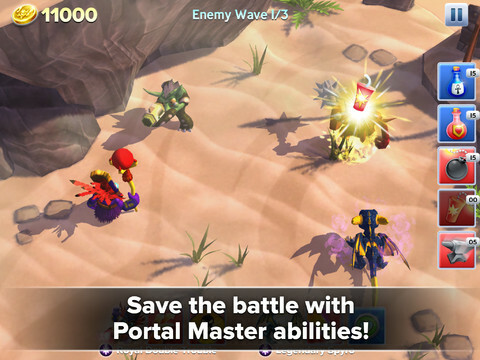 That said, the game is unique in that players control up to two Skylanders at once, with the goal of thwarting Kao's warlord army. The developers broke each level into a grid, and players drag a finger across it to instruct their Skylanders to move. The game is turn based in this regard, as each move causes enemies to shift. 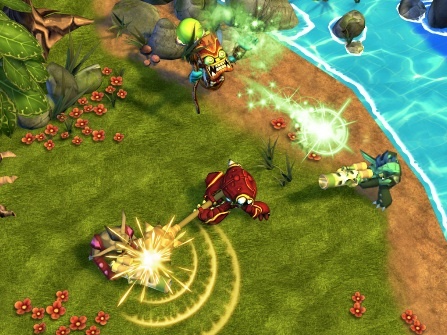 Should both Skylanders and bad guys occupy the same space, the game transitions to battle mode. Here, users point out which creatures they want their Skylanders to attack, and the characters respond in kind, unleashing a plethora of devastating ranged and melee strikes. Survive a set number of enemy waves, and the game rewards the player with virtual currency, experience points and other goodies before returning to the current grid, whereupon which the person continues onward to complete the current objective, be it tackling a particularly nasty troll, or gathering lollipops. Both grid movement and battles work quite well. In regards to the former, it's possible to avoid most encounters by studying enemy patterns. With the latter, pulverizing baddies couldn't be simpler (you literally draw a line to the intended target) and each Skylander possesses signature abilities that deal more damage. The game also includes Portal Master power-ups, and these come in quite handy. Chief among these items, sticks of dynamite, anvils and health potions, to name a few. Of course, this being a Skylanders game, Activision did its best to integrate a wealth of familiar characters spread across eight elements (Life, Undead, Earth, among others). Players are free to purchase characters individually with gems, or enter a Skylander's special link code to do so without forking over the cash, should they already own the action figure(s); from what we've heard from a small number of players, the game may not recognize all Skylanders codes. This is ultimately where the Portal of Power comes into play, and gamers can acquire Skylanders Battlegrounds one of two ways. The first simply involves downloading it from the App Store for $6.99. 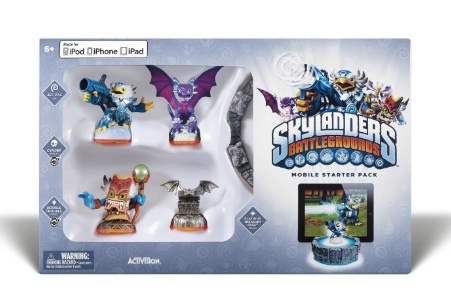 The second, by far the most appealing, is to pay $49.99 for a Mobile Starter Pack that includes a game code, three Skylanders figures, an iOS exclusive Portal of Power that wirelessly connects to Apple devices via Bluetooth and a special Platinum Treasure Chest that comes with bonuses that automatically makes the game much easier, like a whole mess of health potions. If you have every intention of making in-app purchases, the bundle is clearly the best way to go, especially since it also works with Cloud Patrol and Lost Islands. Complaints, fortunately, are minor. Because the game lacks an auto attack function, you must constantly target enemies. Battles, meanwhile, grow somewhat repetitive, especially since avoiding them is oftentimes tougher than it should be. After a while, fighting the same troll, only stronger than the last, gets old. The biggest issue, however, are the number of stages. Two chapters available thus far for a total of 20 levels, with another 20 on the way. Considering that $49.99 barrier to entry, we expected a lot more on day one. Skylanders Battlegrounds manages to maintain a high level of appeal, though, simply because it contains so many different characters, daily bonuses tied into specific elements and a leveling system that takes into account the entire roster, instead of forcing players to level Skylanders individually. If you or someone you know is hopelessly addicted to Activision's kid-friendly cash cow, this game makes the grade. Mobile Starter Pack provided by Activision. What's Hot: Brings a more console-like experience to iPhone and iPad, a wealth of Skylanders to unlock, Portal of Power works flawlessly across all Skylanders iOS games, you don't need to buy the Mobile Starter Pack to receive a quality experience. What's Not: Repetitive, tough to avoid battles, only four chapters, may not accept all web codes.